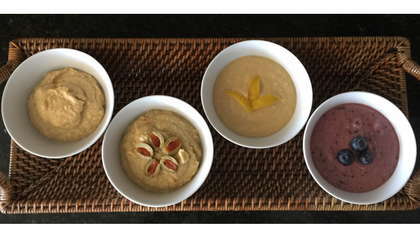 Enjoy an assortment of Homemade Hummus: Garlic, Olive, Tangy Lemon, and Lemon Blueberry. Place one can of drained chickpeas in a food processor. Add 1 Tbsp. olive oil, pinch salt, squeeze of lemon, and garlic. Blend and add a bit of reserved chickpea liquid at a time until desired consistency. Scoop half of the mixture into a serving bowl. With remaining mixture, add 10 green pimento olives (or to taste). Blend until smooth. Scoop into a second serving bowl and decorate with sliced olive. Rinse food processor and add second can of drained chickpeas. Add 1 Tbsp. olive oil, 1 Tbsp. honey, pinch salt, and juice of one whole lemon. Blend, adding reserved liquid until desired consistency and taste. Scoop half of the lemon mixture into a serving bowl and decorate with lemon peel or lemon shavings. Add 1/2 cup blueberries to remaining mixture and blend until smooth. Add some reserved liquid if needed. Scoop into a serving bowl and decorate with a few blueberries for garnish. Serve hummus with fresh cut veggies, whole grain crisps or fruit such as apple slices.